Images are so powerful. They tap into the pool of memories, both personal and universal, that are deep within us. One image can be understood in so many ways—for different people, faiths and cultures or for the same person over time. Today when the Sacred Heart of Jesus popped out at me in my Facebook news feed, memories of my grandma came flooding back. She had a framed image of the Sacred Heart between her living room and her kitchen. As a young child, I remember wondering why the heart had fire and blood on it…and actually I was a little afraid of the image. I never asked about it and she never said anything either. 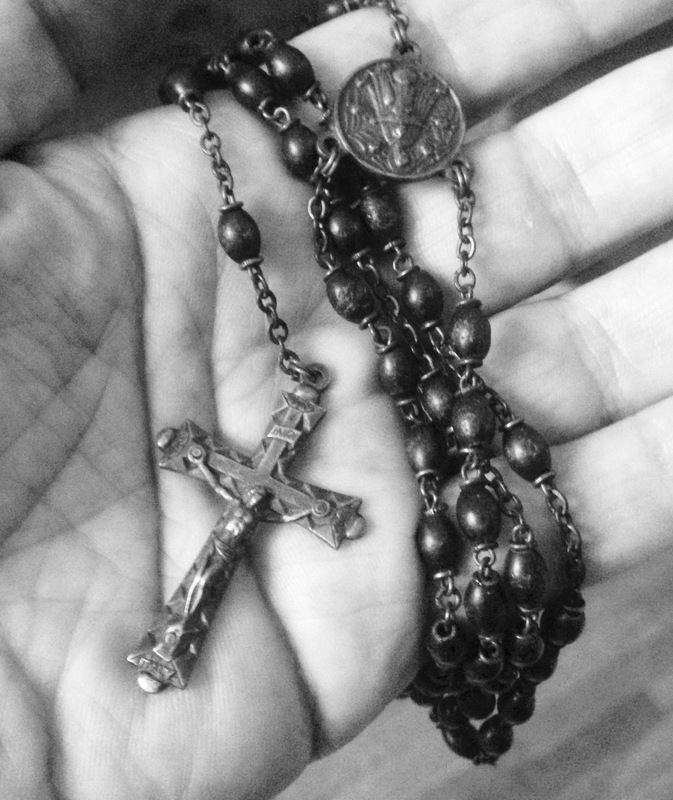 Same with the rosary on her nightstand (pictured below). Or the prayer cards on her dresser. But I remember them. Those images communicated a deep faith in Catholicism and belief in and devotion to Jesus that I intuitively knew she had. 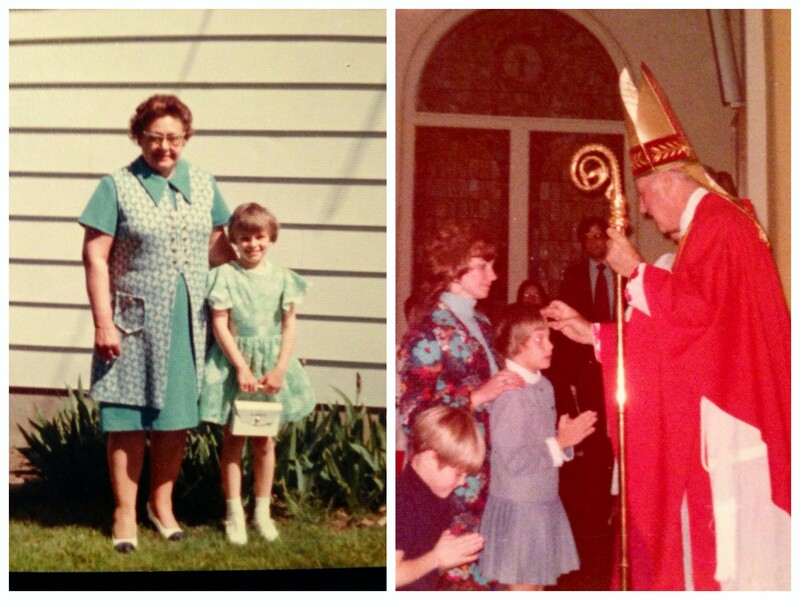 We didn’t talk about faith much, but she always encouraged her sons, their wives and grandchildren to go to Church and she was so proud when I received my First Communion and Holy Confirmation. Her faith in God was important to her but she didn’t have to use many words to communicate that. So often words can narrow an experience, where images can widen our understanding and welcome new insights. Words are road signs to an understanding or experience, but so often words can divide. It is images, through their universal and archetypal qualities, that can connect and unite us. Images stand the test of time, connecting generations and reaching across cultures. Through my spiritual journey, words that used to be sufficient to articulate my beliefs, need to be re-imagined or re-worded. My understanding of God and others has evolved with new experiences and insights. I like searching for, writing and finding words that resonate with me….that give me the feeling that YES, that’s IT!! THAT’S what I believe, THAT’S how I feel! There is no doubt that words are gifts of the Holy Spirit (for me, particularly reading and journaling as a path to God). I love words. I love to write them. I love to read them (as evidenced by my book addiction). But increasingly, it’s images that take me to a place of connectedness with God, a place that is beyond words. Images can be a path to contemplative prayer. Images connect me to the essence of what I believe; words simply attempt to clarify or define. Images take me into Christ, rather than just talking about Christ. As a culture we seem to have self-navigated to words, preferring them to images in our effort to understand, articulate, explain and even argue about the mystery of Christ. Instead we can meditate upon an image, such as the Sacred Heart of Jesus, and allow the Holy Spirit to work within us and give us what we need. We can allow the image to penetrate our entire being with the prayer of becoming more Christ-like with a widened heart for the Body of Christ. We open our hearts to hearing what God is saying in this moment and time with an image. We let the Holy Spirit bring our heart understanding, rather than the thinking mind. A wonderful surprise!! After seeing the Sacred Heart image, memories of my grandma through the years filled me with gratitude for summers spent hanging out with her and my girl cousins, Kim and Michelle, for her home-cooked meals, for her strong sense of family and faith. And then I remembered today’s date—June 16. 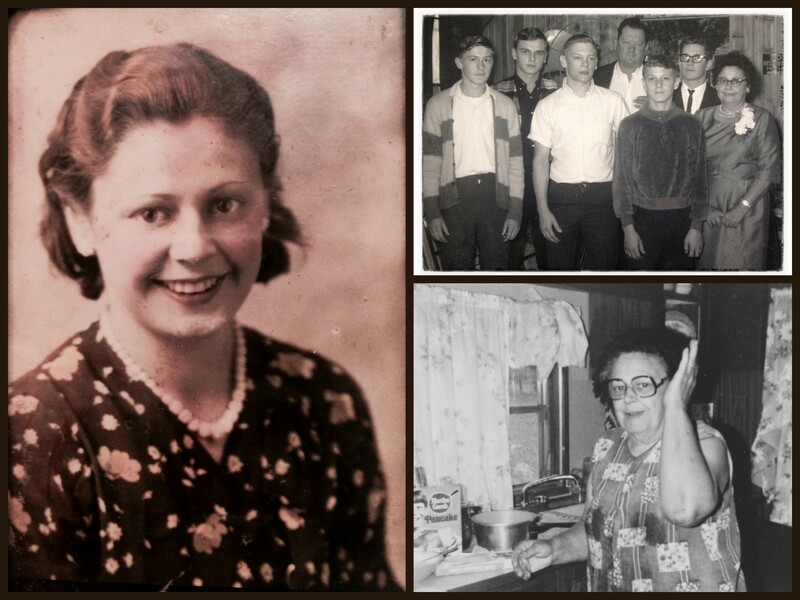 Thirty-one years ago today, my grandma passed away. I think I’ll take the image of the Sacred Heart as a sign from her that, even without words, we are still connected. I, too, had a Grandmother who had a deep faith. She was born in Lithuania and prayed to be able to join her brother here in the US. Within weeks her prayer was answered. Her constant faith and her story of answered prayer was always a strong example to me. When she passed away she was buried in a Franciscan robe…as a testimony to her life as a lay Franciscan. What a lovely memory you have! This was beautiful! I read this through the link in the Dancing Monk page. My mother passed away last March at the age of 93 and what a holy witness and saint she was in my eyes. I too am a Benedictine Oblate, (12 years) associated with the Sisters of St. Benedict in St. Joseph Minnesota. (sbm.osb.org) . I live in a suburb of Minneapolis. I took the liberty of poking around in your Facebook page, you are a wonderful, contemplative photographer too! Nice to meet you!